The (new) plan is to program Thursdays around a person, a thinker, writer, philosopher, a creative genius, a traveler–a person whose life was (or perhaps is) about the stuff that matters*–share some quotes, lift a few words from a speech or lecture, perhaps recommend a few books by or about. In other words, on Thursdays, we’ll turn the podium over to an individual “the house” members might be interested in. That way you’ll get a break from my incessant navel gazing and auto-biographical-slash-memoir ramblings. (I hate the ungrammatical “/”.) Okay? I’ll try to bring you something fresh, and avoid the tired cut-and-paste lame Wikipedia entry. 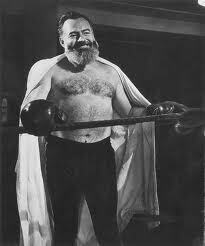 Today we will begin the series with Mr. Hemingway (1899-1961). To weigh in just a moment here (so difficult keeping my mouth shut! ): I am, like so many others, more a fan of the man’s life than I am of his work. Of course Hemingway left us great writing. I am particularly fond, as I’ve mentioned before, of A Movable Feast. And of course the stories. The great short stories–marvelous stuff, indeed. But it is the life that has the grip on my imagination. (He was life outsized, the Lady Gaga of his era.) He was no Montaigne; he did not talk about how to live outright, he showed us–at least his painful, dangerous, depressed-manic, genius version of life. So here are a few of Ernest Hemingway’s thoughts. 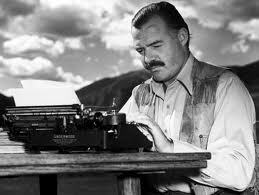 I always say Hemingway, because he taught me how sentences worked. When I was fifteen or sixteen I would type out his stories to learn how the sentences worked. I taught myself to type at the same time….I mean they’re perfect sentences. Very direct sentences, smooth rivers, clear water over granite, no sinkholes. When I am working on a book or a story I write every morning as soon after first light as possible. There is no one to disturb you and it is cool or cold and you come to your work and warm as you write. You read what you have written and, as you always stop when you know what is going to happen next, you go on from there. You write until you come to a place where you still have your juice and know what will happen next and you stop and try to live through until the next day when you hit it again. You have started at six in the morning, say, and may go on until noon or be through before that. When you stop you are as empty, and at the same time never empty but fulling, as when you have made love to someone you love. Nothing can hurt you, nothing can happen, nothing means anything until the next day when you do it again. It is the wait until the next day that is hard to get through. That is a long-term tiring question and if you spent a couple of days answering it you would be so self-conscious that you could not write. I might say that what amateurs call a style is usually only the unavoidable awkwardness in first trying to make something that has not heretofore been made. Almost no new classics resemble other previous classics. At first people can see only the awkwardness. Then they are not so perceptible. When they show so very awkwardly people think these awkwardnesses are the style and many copy them. This is regrettable. Mark Twain, Flaubert, Stendhal, Bach, Turgenev, Tolstoy, Dostoevsky, Chekhov, Andrew Marvell, John Donne, Maupassant, the good Kipling, Thoreau, Captain Marryat, Shakespeare, Mozart, Quevedo, Dante, Vergil, Tintoretto, Hieronymus, Bosch, Brueghel, Patinir, Goya, Giotto, Cézanne, Van Gogh, Gauguin, San Juan de la Cruz, Góngora–it would take a day to remember everyone. Then it would sound as though I were claiming an erudition I did not possess instead of trying to remember all the people who have been an influence on my life and work. This isn’t an old dull question. It is a very good but a solemn question and requires an examination of conscience. I put in painters, or started to, because I learn as much from painters about how to write as from writers. You ask how this is done? It would take another day of explaining. I should think what one learns from composers and from the study of harmony and counterpoint would be obvious. 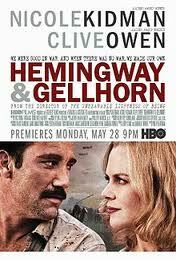 I’ve read a lot of Hemingway, but it is likely true that I have read more about him than by him. The great biography by Hemingway associate, Carlos Baker, is definitive. 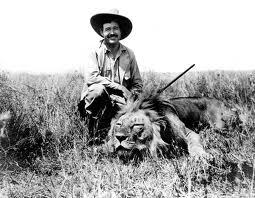 (Martha Gellhorn, Hemingway’s third wife, called it “the King James Version” of Hemingway’s life. Not everyone thought so highly of the book. Truman Capote said, “The Baker book was bad all the way through. It was dull, it was uninteresting, it was badly put together.” ) There are many others–at last count over 500!–more or less of value. For me, however, one of the most interesting books about Hemingway is Denis Brian’s, The True Gen. It’s a collection of memories and reminiscences from friends, lovers, enemies, and wives. It’s heavy on gossip, but rounded out the man in a way I found compelling and brimming with insight. *If there was a tag line to “…the house…” it would be, We think about the stuff that matters. But wait!– whether you know it or not, we have a tag line, A Journal of Life Pursued. Can one have too many tag lines? Too many interests? 1. He seemed to find plenty to do to help him get through to the next day of writing! And how was he not so hung-over that he just needed to sit quietly and moan with an icepack on his head? 2. If only I knew enough about any of Hemingway’s influences to actually be influenced by them. Amazing. Think I will go copy some of his sentences. Is that like the infinite number of monkeys? I made the acquaintance of man while traveling who had visited all the Hemingway homes, including the little apartment in Paris where he and Hadley had been hungry but happy. This inspired me, but alas, I have only one Hemingway home to my resume, Key West. Perhaps you’ve visited? There is a lookout tower on the property, which, if I recall correctly, prompted him to purchase the place. It was the tallest structure on the island and he knew that no matter his condition at night he could make his way there. Clever a man who knows to make such allowances. 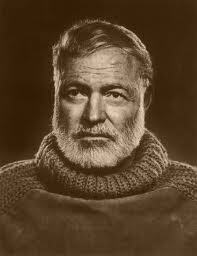 Here is a site which might be of interest: http://www.foodrepublic.com/2012/10/30/7-things-you-didnt-know-about-ernest-hemingways-dr Seven things you didn’t know about Hemingway’s drinking habits. And yes, the influences. I started to count the ones I was familiar with, but soon ran through the list with a depressing few. I think many of us have a great many influences, regardless of our discipline, but don’t know we are their subjects as it happens. It would stand to reason that we are ignorant as a result and the influence is consequently lost–this is my personal observation only. Thanks for the note!, as always. Two walk-bys for me: Paris and Key West. “We don’t know we are their subjects”, true, but don’t you think the influence remains…in some kind of blissful oblivion? A good question to ponder. Sort of like the “examination of conscience” that those those of us who were schooled in Catholicism had to do prior to saying confession. I hope that “influence” remains even if we are not aware of it. I don’t know how it could be otherwise. But I have spent a lifetime–so far–reading–and I could not tell you much of what I learned from anyone specifically. I am like Montaigne said he was, in that way. (Though I don’t particularly believe him.) When I read Didion in Hemingway, as I inserted into the post, I think, Now that is an influence, a teacher, a mentor. Part of me worries that blissful oblivion, a wonderful turn of phrase, is just the lazy approach. When you read Nabokov tomorrow, perhaps you will better understand what I am trying to say. Stay tuned. We’ll regroup then. Just re-reading your previous entries and I enjoyed this one about Papa Hemingway; a complex personality that is not to be easily understood. Which reminds me, speaking of not easily understood – have u gotten through any Falkner? Thank-you. Kevin~ Good morning. Glad you’re still stopping by. That’s good to know. Faulkner: Yep. I read As I Lay Dyingthen followed that with Sanctuary . I’m breaking from him for a bit, staring a similar reading project with Philip Roth. (In the Hemingway verses Faulkner war, I’m so far still on the Papa side.) Thanks for asking.